Reivers Lad recorded a first hurdling success at Kelso on Thursday for local owner John Stenhouse and Hawick jockey Craig Nichol – also providing Cumbrian trainer Nicky Richards with the first leg of a treble. The odds-on favourite and former bumper victor cruised home to a comfortable six-length success in the opening Au Revoir Jim & Judy novices’ hurdle race. Having just his second start over hurdles, the six-year-old and was bred at Hawick by Willie Amos. Lycidas, from James Ewart’s Langholm stable, made most of the early running to finish second, while Eileen Smith’s Paper Roses gave a good account to take third for Donald Whillans Hawick yard. Nicky Richards enjoyed a quickfire double after Takingrisks headed the following Miller Celebration novice handicap chase, under Ryan Day, ahead of Spanish Fleet from George Bewley’s Southdean stable. Four went to post, with Vicenzo Mio looking the all-out winner at the last until petering out up the run-in. The Richards treble was completed by Better Getalong in the concluding Walk With Scott Foundation bumper – also providing jockey Ryan Day with a double. The winner got the better of Rose Dobbin’s Better Reign in another thrilling finish. 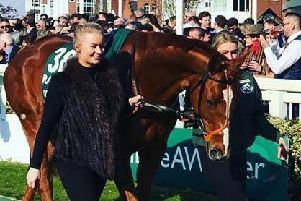 Hawick trainer George Bewley, soon to relocate to Cumbria, saddled Forty Crown – ridden by his son Jonathon – to a 6-1 victory in a competitive Brewin Dolphin handicap hurdle race. It was Forty Crown’s third victory from four runs at the Borders track. Champion Hurdle entry Cyrus Darius produced an impressive seven-length victory in the feature £25,000 Timeform Morebattle hurdle race, posting his fourth win from five starts for Yorkshire trainer Malcolm Jefferson. Jockey Harry Skelton’s frustration was clear after Born Survivor crashed out at the penultimate flight, while One for Harry had to settle for the runners-up slot again. The equally valuable Ivan Straker Memorial chase was won in equally impressive style by the Paul Nicholls-trained hot favourite Saphir Du Rheu. In a thrilling finish to the Border Hotel Kirk Yetholm hunters’ chase, Premier Portrait thwarted hot favourite Black Thunder, bidding for a second course success en route to the Cheltenham Foxhunters. The 12-1 chance clinched the spoils by a short head and gave 18-year- old jockey Gus Levinson his first winner under Rules. His father, Charles, trains the winner and the family were enjoying a successful first visit to Kelso racecourse. 1.25pm – 1 Reivers Lad (C. Nichol) 4-5 fav, 2 Lycidas 5-2, 3 Paper Roses 25-1. Seven ran. N. Richards, Cumbria. 1.55pm – 1 Takingrisks (R. Day) 11-10 fav, 2 Spanish Fleet 100-30, 3 Vicenzo Mio 9-4. Four ran. N. Richards. 2.25pm – 1 Cyrus Darius (B. Hughes) 5-2, 2 One for Harry 5-1, 3 Knockara Beau 16-1. Four ran. M. Jefferson, N Yorkshire. 3pm – 1 Saphir Du Rheu (S. Twiston-Davies) 1- 7 fav, 2 Firth of the Clyde 20-1, 3 Bernadelli 10-1. Four ran. P. Nicholls, Somerset. 3.35pm – 1 Forty Crown (J. Bewley) 6-1, 2 Landecker 7-2 j fav, 3 Maxie T 4-1. Seven ran. G. Bewley, Hawick. 4.05pm – 1 Premier Portrait (G. Levinson) 12-1, 2 Black Thunder 1-8 fav, 3 Wicklow Lad 20-1. Seven ran. Dr C. Levinson, Gloucestershire. 4.40pm – 1 Bettergetalong (R. Day) 1-4 fav, 2 Some Reign 3-1, 3 Western Lass 50-1. Six ran. N. Richards.